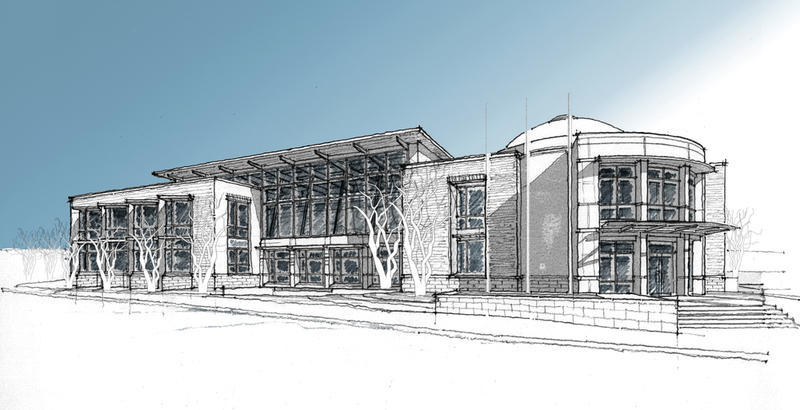 The 56,000 sf new library will occupy the corner of a prominent intersection in downtown Petersburg, VA, rebuilding the urban fabric along Washington and Market Streets. The architecture is conceived as a contemporary, yet compatible counterpoint to two adjacent historic churches and a late 19th century warehouse building. A natural material palette of brick, glass, stone, and wood extend four centuries of local building tradition to create a modern and monumental home for the town’s new library. Large windows will infuse the interior with natural light throughout the year and be lit at night from within to encourage views into the building from the street. Passive solar strategies such as angled windows, bris-soleil, and cantilevered overhangs will minimize summer heat gain. The L-shaped plan responds to the site’s urban condition and also separates two programmatic elements. The library component stretches along the east-west axis facing south, while the east facing Market Street wing contains an auditorium and meeting rooms for city council and the public. The two ells are connected by a sun lit glass enclosed art gallery / cafe and a large rotunda with its second floor reference library. Rear entry terraces with native plantings, a river birch allee and thick granite slab benches will create a memorable procession into the building as one passes though a cascading water fall over a stacked granite wall symbolic of the falls of the Appomattox River. Seasonally, these outdoors rooms will become an extension of the interior gallery. Willow Oaks, Red Maples, River Birches, flowering shrubs and perennials will be planted throughout the three-acre site establishing a new urban park-like setting for the building. Construction has since been completed.